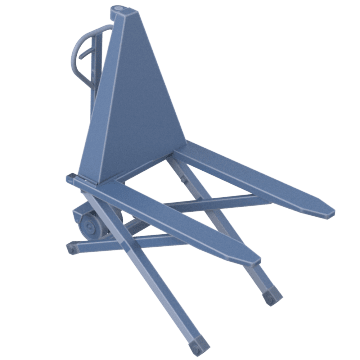 Use these pallet trucks to position open-bottom pallets and containers at the best height to access materials when loading and unloading, which helps to increase efficiency and reduce strain on workers. They are for use on flat level surfaces and should not be used for lifting people or lifting loads over people. Only use these pallet trucks with open-bottom pallets; they are not for use with traditional stringer pallets. 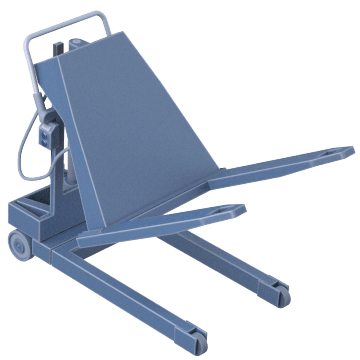 Also known as scissor pallet trucks or jacks, these trucks transport open-bottom skids and pallets and lift them into a convenient position for loading and unloading, which causes less physical strain on workers. Their 3-position hydraulic lever and steering handle helps to improve efficiency and decrease manual effort when lifting. Trucks disable movement when the lifter is elevated above halfway to prevent tipping hazards. 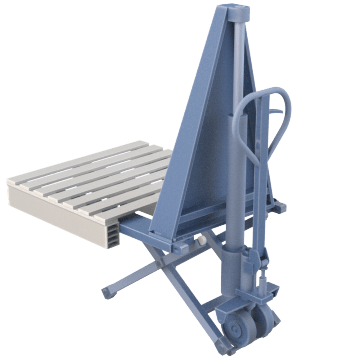 Also known as container tilters, these motorized trucks are designed to lift and tilt industrial containers into a convenient position for loading and unloading contents, which helps improve efficiency and allows the worker to easily reach the items at the bottom of the container without having to strain.